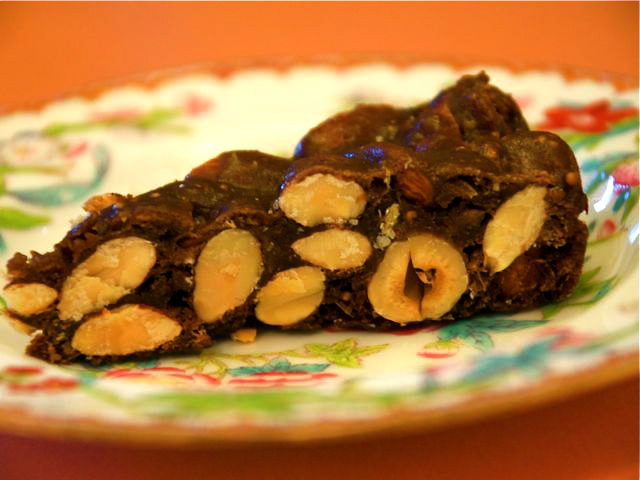 I love the dense, sweet, chewy, dried-fruit-and-nut confection called panforte. It's a splendid rich partner for coffee, dessert wines, or spirits, but it is also an inspired addition to a cheese platter. My first panforte was made in California by Mendocino food celebrity Margaret Fox, when we were both in our 20s and about to launch our respective businesses (my chocolate dessert shop, her restaurant). Margaret's panforte rivaled (topped!) the original specialty from Siena. By the time we were in our 30s, I was buying oodles of panforte "di Mendocino" for my Cocolat shops. I finally visited Siena a few years ago, and fell hard for the "other" panforte, the dark, spicy, medieval rendition called panpepato ("pepper bread") or panforte nero_ ("black strong bread"). It's easy to make, is filled with tasty, healthy ingredients, and keeps forever. Position a rack in the lower third of the oven and preheat the oven to 300 degrees. Grease the pan or spray it with vegetable-oil spray. Line the bottom with a circle of parchment and the sides with a 2-inch band of parchment. Grease the parchment, bottom and sides, liberally. In a large bowl, mix the hazelnuts, almonds, flour, cocoa, spices, orange zest, and figs. In a 3- to 4-quart saucepan, bring the honey and sugar to a full rolling boil. Boil for 15 seconds. Off the heat, pour in the dry ingredients and mix well, working quickly, before the syrup cools. Scrape the mixture into the prepared pan and spread it evenly. Bake until the batter bubbles in the center as well as the edges, 40 to 45 minutes. Cool the panforte in the pan on a rack. Invert the panforte onto a plate and remove the pan. Peel off the parchment and turn the panforte right side up. If desired, dust the top with powdered sugar. Serve in thick slices. Panforte keeps for months, well wrapped, at room temperature. Good-quality figs are available in the bulk food sections of food groceries and in gourmet markets; those packaged by commercial dried fruit companies are generally not as good.